Fixed incorrect QR code being generated for the Karaoke Screen. Fixed a bug where a filename in an .M3U playlist file containing a # symbol was disregarded as a comment line, among other minor internal fixes. This is a bugfix version. If some of your Karaoke ZIP files weren't opening correctly in the last couple of releases, this update should fix the problem. This is a minor bug fix for those having problems with the "Server" button not launching the Server dialog. This is a minor bug fix release. The master MONO button was not functioning in previous versions, this update fixes that. This update has a few minor bug fixes. Also fixed issues with certain Karaoke files not showing lyrics - specifically karaoke files using "channels" other than channel 0 (zero) wouldn't display without having to navigate through the right-click menu. In other words, if the lyrics didn't display on some of your Karaoke files, this update should fix that. Additional bug fixes and feature enhancements. You can now sort your Search results by File, Location (Path), or even Duration. More search result columns are coming soon, with more sorting options to go with it. Note that sorting by Full Path (Location column) in descending order - the default setting - is always fastest, as this is the order the music is sorted in the actual database. Fixes include a potential crash bug after indexing your music database. This has been confirmed fixed, however if you were experiencing this particular issue we strongly encourage that you do a FULL re-index (checking the Completely Reset Index box in the Search Options) to eliminate any corrupted data in the index. LOTS of bug fixes and speed improvements, this version uses less memory, especially if you have a lot of song files indexed. The indexer is further improved, faster, yet still compatible with the format introduced in 7.7.7 (so upgrading from 7.7.7 to 7.7.8 will NOT require a full re-index). This is a MAJOR upgrade, and is STILL free for all licensed 7.x users! If you tried the free trial before and didn't like it, please give this one another try - it will start your trial over, even if you used up the 14 days on a previous version. The main improvement is in the Music Database Indexer. It does the indexing in two stages. The first stage takes only minutes, and lets you access your database immediately. The second stage is all done in the background, where it gathers more information about your files in order to provide better search results. 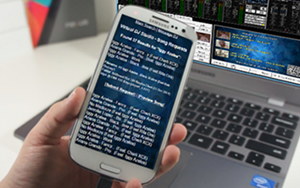 Also new: You can allow your customers to follow-along with the Karaoke Lyrics on their Cell Phone or other device with the MyDjSongBook.com app. Many other bug fixes and minor improvements are in this new version, so be sure to upgrade to 7.7.7 today! Many bug fixes, especially when indexing lot of ZIP files. Strongly recommended update for all 7.x users. Also improved response time when using the MyDjSongBook Request App. Many improvements to the new features introduced to 7.7 - if you have any version of 7.7, it is strongly recommended that you update to 7.7.5 for best results. Major new update with a major new feature: Fully server-hosted Request App. This Eliminates the need for customers to be on the same IP network (WiFi) and provides a secure, feature-filled way for your customers to submit song requests AND profile pictures, right from their own smart phone. No App installation required - fully web-based. 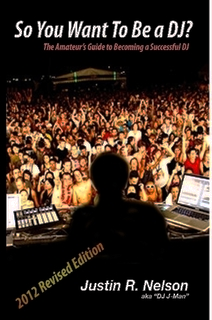 See our Hosted App Page, or go directly to MyDjSongBook.com for all the details or to subscribe to this all-new service. More issues with the Saved Singers list have been addressed. Specifically, if their saved songs no longer exist, you now have options to locate the song or a similar replacement. Fixed some issues with the Saved Singers list, including handling of profile pictures, non-existent saved songs, and other minor improvements. Some internal bug fixes and improvements. Most notably, if an error message pops up behind the startup splash screen, the program would appear "frozen" until you could click the invisible message box. This has been fixed. This update speeds up file indexing somewhat, but mostly adds support for a wider variety of ZIP files, including those using Deflate32 and Deflate64. 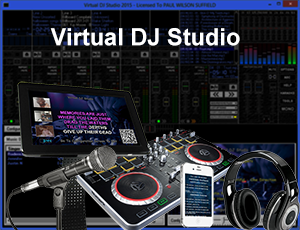 In other words, if some of your Karaoke ZIP files do not play in the other versions of Virtual DJ Studio, 7.4.1 should fix that problem. This update added multiple file deletion, and even more improved configuration wizard for new users, along with a few minor bug fixes. This update provides more intuitive search indexing options, and an improved Configuration Wizard for first-time users. We have fixed a few very minor bugs, and added one new feature: You can now select certain folders that will automatically reindex every time you start VDJ. This is handy for a Downloads or New Songs folder, so that you don't have to reindex your entire library when you add new songs. See the Options dialog from the Search window for details. We have added a few new features to the 7.x series. 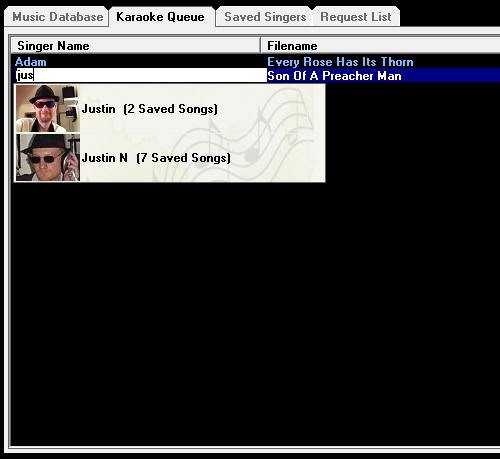 Most notably is the Auto-Complete feature when you add a song to the Karaoke Queue. 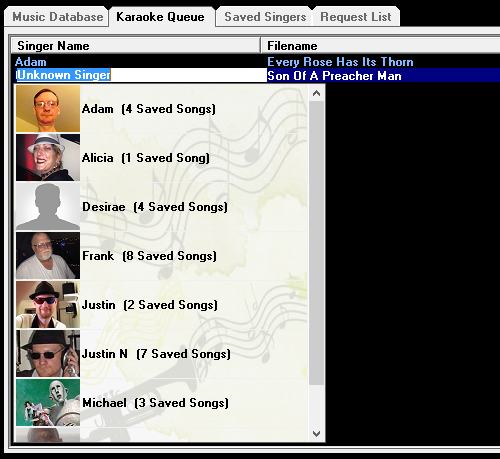 You can choose not to show the profile pictures, and other options by clicking the Options button on the right-side of the Karaoke Queue tab, or choosing Karaoke Options in the Program Options dialog. You can now rename or delete files directly from within the Search Results. This affects the file on the filesystem as well as in the database. Simply press F2 to Rename a file, or press DEL to delete it. You can also right-click for more options. All Content Copyright © MCMXCVIII - MMXVII by Next Generation Software. All Rights Reserved.